Probably the most important invention since the 2nd World War, lasers have been put to use in countless devices that have served society well. From a personal point of view, they’ve changed my life and made me far more confident thanks to an excellent dose of hair removal courtesy of the SK:N clinic. But let’s not forget even for a moment… that used incorrectly, or without care… lasers can be incredibly dangerous. In October last year, the use of lasers for many cosmetic treatments was deregulated. This essentially means that unless your hair removal treatment is adminstered by a doctor or a registered nurse, the operator no longer needs to register with the regulators. To me, this is madness. It means that the operators are often left unchecked and potentially untrained. I’ve recently had a very close shave (pardon the pun) with a laser treatment. I booked myself in to a local clinic for some IPL and they proceeded with a test patch. On the first shot I felt enough of a ‘ping’ to make me jump and immediately knew things weren’t right. 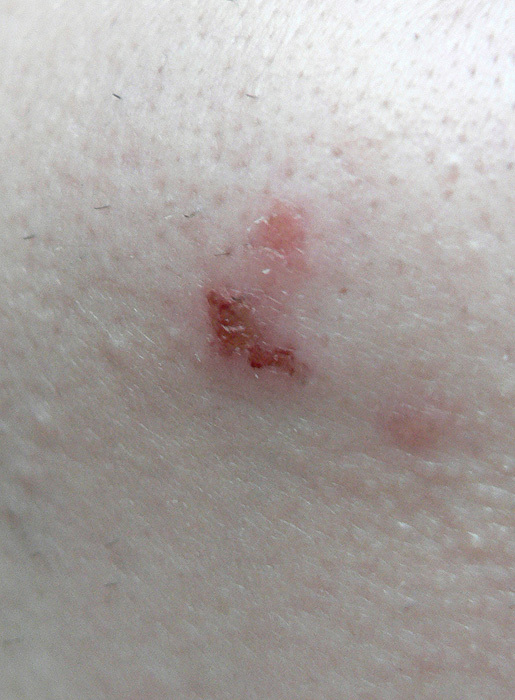 When I got home, I could see that notch of skin had been clean removed from the area treated. 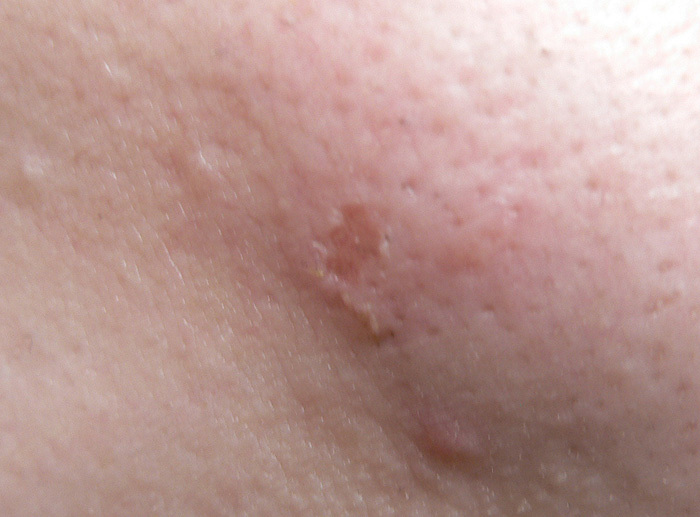 The above photo shows how the area looked immediately after treatment. It shouldn’t look like this. I contacted my practitioner who was horrified. She said that she had never ‘burnt anyone before’ (her words) and asked me to come back if it didn’t heal well. Here’s how it looked 2 days later… excuse the hairs, I obviously wasn’t shaving in the damaged area. I looked after the burn carefully and used Aloe Vera on it regularly. The most important thing was not to pick at the scab or dislodge it until it was ready to fall off. This was three weeks ago and I’m left with a very, very small scar that’s not noticeable unless you know it’s there AND look for it. Thankfully. The IPL clinic have been very good since I flagged up this problem and I know that the operator has learnt a lot from it herself. When I returned to the clinic we discussed what might have gone wrong in this instance and she agreed to test patch me a number of times in different places until we were confident this wouldn’t happen again. I just want this to serve as a cautionary tale. There are so many ‘deals’ around on IPL and Laser at the moment. 1. Get thoroughly test patched on all areas to be treated. 3. Do your homework about your IPL/Laser provider. Ask them questions and don’t be afraid to walk away if you’re unsure. I consider myself incredibly fortunate. A rogue operator may not have bothered to test patch and before you know it, you’re multiple shots in (you can do an entire lower face in around 6 minutes) and left with permanent scarring. I told you on twitter that I had IPL and for me it did not work (though I have fair skin and thick, in my opinion: dark hair… not enough apparently). No hair fell out after the treatments and everything is back as it was before, I think even worse than before! I do not believe any of the beauty industries promises anymore! Though I’ve got hirsutism none of the anti-hair-methods worked with me (waxing 5 days – not 4 weeks! And a rash), and IPL should in these cases. Anyhow, did this happen because your skin is prone to sunburns because it’s too fair – or was anything wrong with the settings of the… machine? Oh oww that looks painful! Poor you, I hope nothing like this ever happens again! Scary. Good advice. Necessary advice. You are absolutely right! I had a facial patch test on both sides of my face and had to wait 10 days before they would accept me for an appointment. Fortunately, I had a very good result, but people with delicate, fair skin are especially vulnerable to laser treatment. I had IPL on my face to remove irregular pigmentation, but the technique is pretty much the same. Darker skinned women should also be careful with IPL, as it can leave irregular patches of pigmentation. OUCH!! How scary! I actually had an IPL photofacial done quite a while ago with no test patch done. Thanks goodness it worked out OK. She was overly cautious though as I hadn’t rec’d a test patch so I think in the opposite direction she had it turned down so far I didn’t see much in the way of results. Ouch is right. I’m glad it’s healed and only left a small scar, could’ve been far worse. But yes, very important issue and good to raise awareness. Wow, I’m currently having IPL on my underarms (almost done) but your posts scared me! That definitely serves as an important cautionary tale. In the hands of the wrong person, these treatments can be so dangerous. It’s part of the reason I haven’t had my blemish sorted yet. Although so many places offer treatment I really want to go something staffed by medical professionals. After all, who wants a cosmetic treatment that leaves you scarred? Holy crap, I’ll *bet* you jumped! I have never had a patch test, but the dermatologist has a great deal of experience and has skin just like mine, so she started me slowly and went for the big guns the second time. I believe that most operators over here start around 30 to 50 joules, though some start as low as 15 for super sensitive skins. I’ve had V-beam twice and IPL 6 times, and I have never left the office with more than redness that died down to normal by the time I arrived home. Oh, wait, the V-beam left some bruising, but I bruise really easily, and I took Arnica after which helped heal me fast. I also knew that the treatment could bruise, so I was not surprised or upset. Did they not use any IPL conduction gel on you? An absence of gel would definitely make things much much worse. As an aside, I had no idea IPL was used for hair removal. I though it was used only to treat diffuse redness from rosacea, as well as sun damage (brown spots). I don’t have much more than blonde downy fluff on my face, and I don’t think any of it went away from my IPL treatments. Oh, and Jamilla is absolutely right. Darker skins must be very careful about undergoing laser treatments or they can end up with hyperpigmentation. I’m sorry you had a bad experience and hope you aren’t in any lingering pain. Yipe goodness…it’s good you flagged it but were gracious I think, was the intensity of the laser too strong or something? I’ve heard that ” Bio-Oil PurCellin Oil” works wonders on scars. That’s so scary! I’ve been thinking a lot about getting IPL and I’m glad you’ve been posting about it so I know what to look for. I’m sorry about your experience and I hope your scar heals up nicely! Do you have Mederma over there?